Oregon's Regional Spelling Bee in Portland is presented by the Pamplin Media Group and Comcast. It began with bagel. That's B-A-G-E-L.
Kabir Rathore Muthu — tasked with laying out the letters for the first word of the first round of the spelling competition — asked for the definition. More than three hours later, and after a confident recitation of the butterfly species known as H-E-S-P-E-R-I-D, Muthu was crowned champion of Oregon's Regional Spelling Bee, presented by the Pamplin Media Group and Comcast. "I was surprised that everybody kind of made mistakes. I felt lucky that I got words that I knew," the seventh grader said following the event on Saturday, March 17 at the Hollywood Theatre in Portland. "There were a lot of tough bonus words, and in the end, I got one that I could spell first," he continued. "I'm happy for him. He worked steadily," added proud pa Prabu Muthu, while also crediting mom Anjali Rathore. 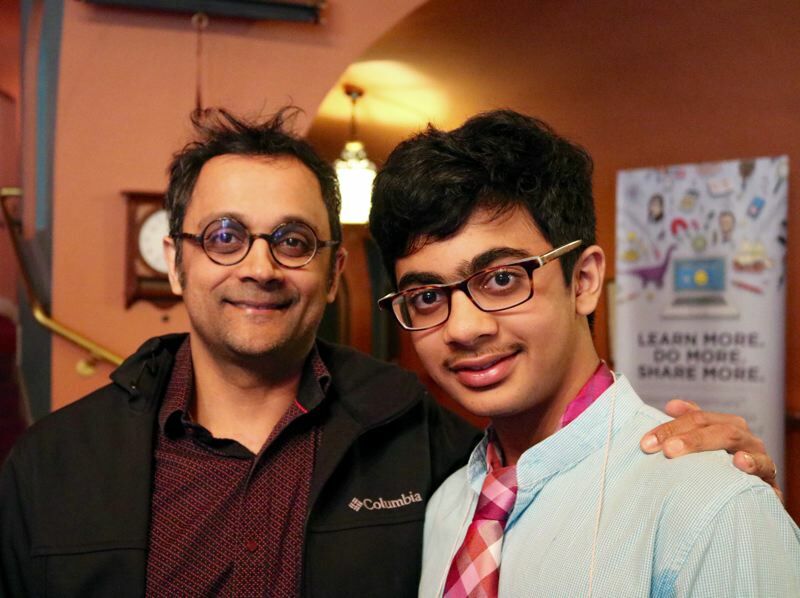 Muthu, 13, bested his classmates at Portland's Access Academy to compete in the statewide bee that included 48 participants in grades four through eight, from public, private, alternative and home school groups in Multnomah, Washington and Clackamas counties. As Oregon's newest living dictionary, Muthu has won an expenses-paid trip to Washington, D.C., where he'll face about 250 other heavyweights at the Scripps National Spelling Bee on May 29. The victory came after a 20-minute duel with second-place finisher Namrata Venkatesan, a seventh grader at Stoller Middle School in Beaverton. 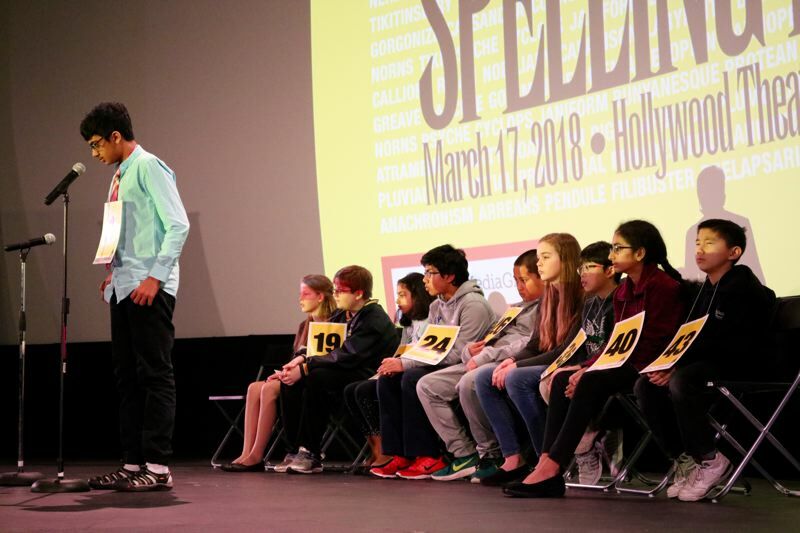 The two spellers sparred over vocabulary that included cirrhosis, susurrus, kibitzer, ekphrasis, nociceptive and oligotrophic during the final showdown. Both students were on the cusp of elimination multiple times. That's because after one contender stumbles during a bee, the presumptive winner must successfully complete a one-word, one-person round — otherwise the other player is back in. Venkatesan blamed nerves for her fatal misspelling of rochefort, a type of blue cheese named for a region in France. "I really like the way different languages sound," said Venkatesan, who spent an hour or two a night (and four hours on weekends) preparing for the contest. "This is my second (to) last year doing the bee. I just wanted to make the most of it." Tai Tovey, a Lake Grove Elementary School fifth grader, placed third. Every student who appeared at the event had already won a preliminary round. "I took a word and I pictured it in my head, then I repeated the word," said River Grove Elementary fifth grader Justin Rim, describing his memorization strategy. "Sometimes I write on my hands." Now in its 15th year, the Regional Spelling Bee is a yearly academic journey that helps kids develop a love of language and learn lifelong lessons about correct English usage. Newspapers have been involved in the spelling tradition since at least 1925, when The Louisville Courier-Journal hosted the first Scripps Spelling Bee. There were just nine contestants that year, though this year's national test will be televised live on ESPN and the final rounds will likely appear on some local stations. "We are so proud to be in our 15th year with the Regional Spelling Bee," said J. Brian Monihan, vice president of the Pamplin Media Group. "It is so rewarding to watch these students succeed and have a love for learning." 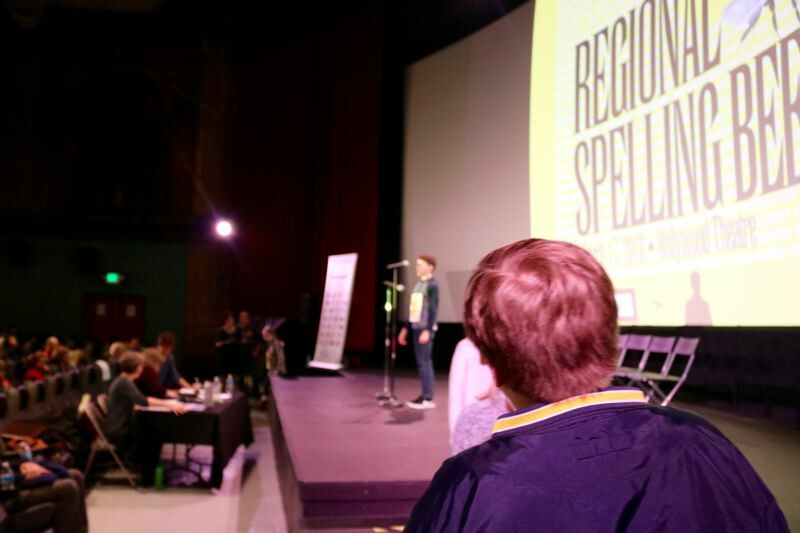 "It is an honor for us each year to be the organizer of this spelling bee," noted company President Mark Garber, publisher of the Portland Tribune. "The Pamplin Media Group's mission is to build strong communities through great local journalism, and this fits that to a T."
Other sponsors included Flying Pie Pizzeria, the Hollywood Theatre and Comcast. Rosemary Reynolds, a KXL reporter and anchor with Alpha Broadcasting, served as pronouncer. 10:25 a.m. After a barrage of questions to the judges, the student spellers have nearly finished the practice round, where they spell their name and tell the crowd of 100s what school they are representing. The first round will begin shortly. 10:34 a.m. Elaina Oommen, representing Damascus Middle School, is the first to be eliminated from the competition during Round 1. Her word was "crimp." Other spellers have stumbled on the words "confidence" and "cleanser." 10:48 a.m. "Wiki wiki" proved no challenge to speller Namrata Venkatesan from Stoller Middle School. The word, of Hawaiian origin, means "fast" or "quickly." 10:57 a.m. Aubrey Moffat of East Orient Elementary School was forced to say goodbye after running into trouble with the Spanish word "adiós." Spellers are not expected to note accent marks while on stage, however. Tai Tovey, of Lake Grove Elementary, managed to spell Italian phrase "graffiti" a few minutes later. 11:05 a.m. Justice Brensdal, of Mountain View Middle School, was able to remember the "Alamo," or at least how to spell it. He joked earlier that his first name is spelled the same way as in the Pledge of Allegiance. Venkatesan, a seventh grader, soon encountered another foreign word, "panzer." She had no trouble with it. 11:18 a.m. Andrew McDougal of Boones Ferry Primary is out after tripping over the word "rhetoric." More than 15 spellers have been eliminated so far. 11:25 a.m. Keith Garner of Grace Lutheran School took his time while spelling out "metamorphosis." "M-E-T-A," he said, "M-O-R," followed by a long pause. His follow-through was perfect, and the sixth grader will continue on to the next round. 11:30 a.m. Justice Brensdal took a bow and left the contest after being given the word "isinglass." The noun of Dutch origin refers to a type of gelatin made from fish. Ruby Hohnstein of Multisensory Learning Academy was knocked out of the contest immediately afterward after facing the challenging phrase "ubiquitous." 11:38 a.m. Sixth grader Ethan Yip of Three Rivers Charter School breezed past the silent spelling of "pneumatic," a word of Greek heritage that refers to spirit or compressed air. Yip continues on to the next round. But another speller ran into trouble with the Hindu word "jiva" that relates to religious concept of life force, essence or soul. 11:46 a.m. More than half of the starting participants have been eliminated from the Regional Spelling Bee. Karthik Krishnamurthy of Meadow Park Middle School is out after guessing that "kirtle," an archiac term for a woman's petticoat, begins with a Q. 11:52 a.m. "No one knew of Daniel's singing skills until he sang in the karaoke competition," announced a judge after Loggan Trujillo of River Mill Elementary asked for a definition. That doesn't sound too likely, given our experience with the K-word. Trujillo, a fifth grader, swapped his vowels and was removed from the contest. There are just 13 participants left. 12:03 p.m. Namrata Venkatesan tapped out the word "repertoire" on her hand. The French phrase was no problem for the seventh grader. A 10-minute intermission is happening now, then the finals begin. 12:24 p.m. The field of finalists has already been winnowed to six. Hope Hoesing of Franciscan Montessori Earth School, Keith Garner, Drishti Singh of Hallinan Elementary and Ragheeb Hoque have all been eliminated with words including "bitumen" and "aioli." 12:32 p.m. All three finalists have stumbled on their final word, meaning each has another chance to win. The final three are Kabir Rathore Muthu, Tai Tovey and Namrata Venkatesan. 12:35 p.m. It's down to Muthu and Venkatesan. Muthu has misspelled the word "nociceptive," but Venkatesan has also erred. Both players return to a final showdown. 12:41 p.m. Neither participant can remove the other. Muthu has misspelled "susurrous" and Venkatesan has misspelled "rheophilic." 12:46 p.m. Both players are locked in a duel, either both spelling their words correctly or being unable to knock out the other player during a final 1-person round. 1 p.m. Almost 15 minutes after they began, neither contestant can land the knock-out blow. A player must complete a one-person round successfully before the winner of the bee can be declared.